BCV principals Hans Baldauf and Chris von Eckartsberg are providing dispatches from the road this week as they travel to Milan for Expo 2015. 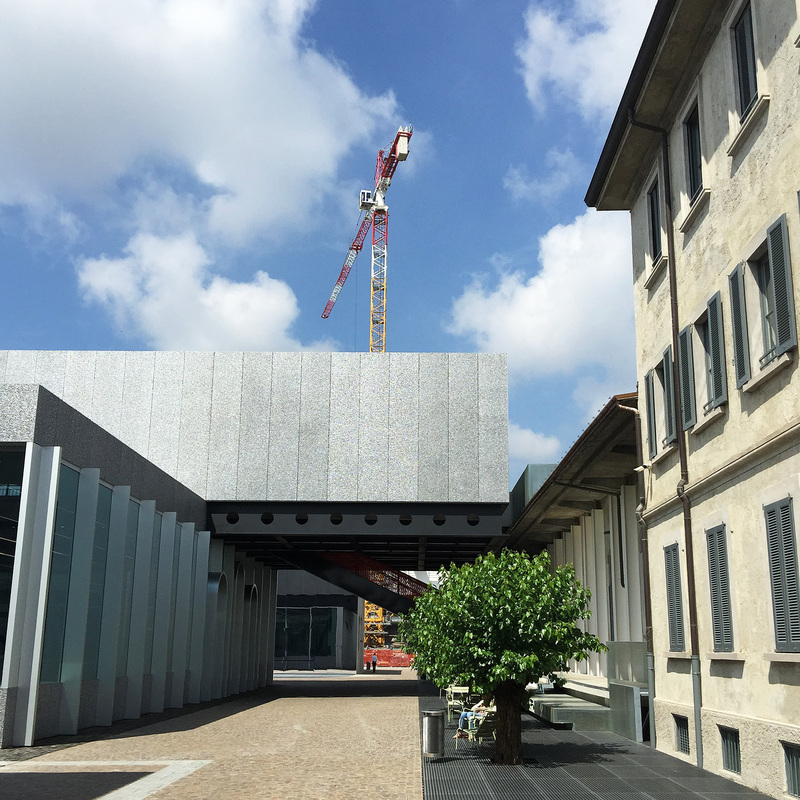 On Wednesday, Hans and Chris visited the new Fondazione Prada. Hans shares his thoughts below. 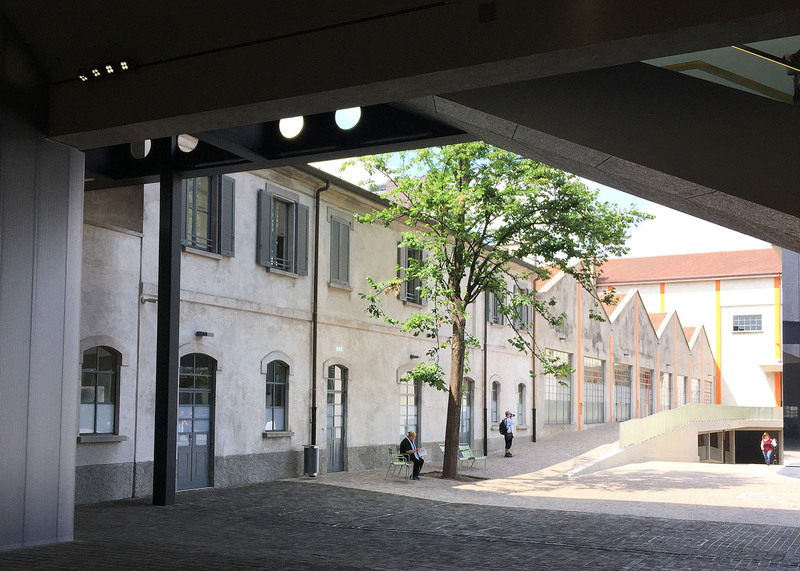 One of the benefits of being in Milan for the Expo was the opportunity to spend half a day at the new Fondazione Prada, designed by Rem Koolhaas. The project occupies an old distillery from the twentieth century. It has been reimagined by Koolhaas as an arts campus that both creates a sanctuary for the arts and invites the community to be a part of it. The Fondazione is not a preservation project and not a new architecture. Two conditions that are usually kept separate here confront each other in a state of permanent interaction – offering an ensemble of fragments that will not congeal into a single image nor allow any part to dominate the others. I like this project for a host of reasons. The themes that Koolhaas addresses here are ones that we continually explore at BCV, and I have recently discussed in my blog post on radical transformations – how one transforms a building while at the same time revealing aspects of its DNA which may not have been obvious originally. I like the way in which the factory precinct – originally walled off from the public – becomes a public space and simultaneously a sanctuary. It is interesting that we have models for this that are over fifty years old in San Francisco in the Cannery and Ghirardelli Square – one a fruit canning facility and the other a chocolate factory. 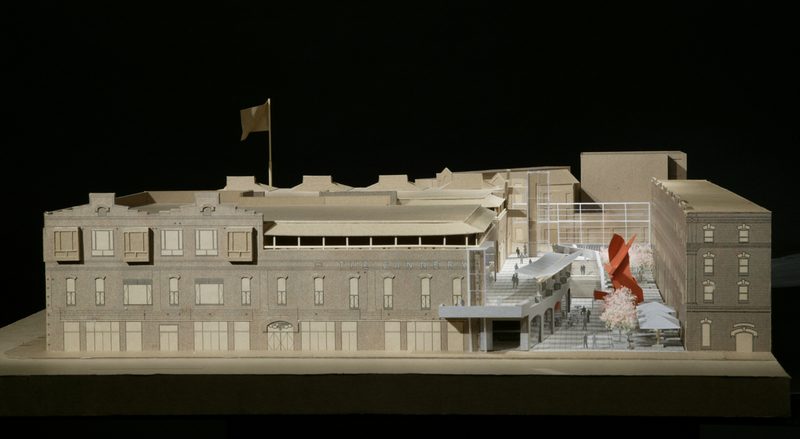 A model of the Cannery project. We have thought a great deal about these two projects, having designed (in collaboration with ROMA Design group) a third generation for the Cannery that unfortunately fell victim to the economic downturn in 2008, and through our current work on the third incarnation of Ghirardelli Square. Each of these projects expresses the layers of intervention in interesting ways. I am fascinated by how Fondazione Prada addresses Italian cultural memory. 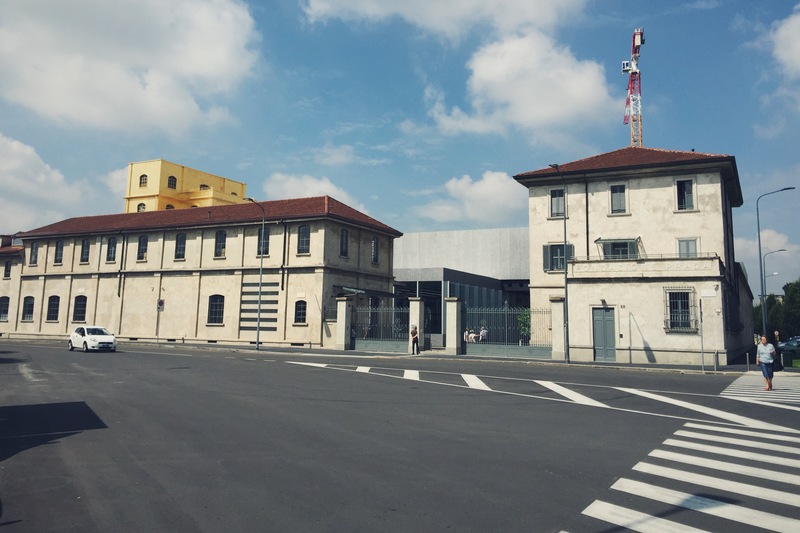 The early part of the twentieth century was a period of dynamic industrial growth in Italy and factories such as this are a legacy of this period, as well as many infrastructure projects, like railroad buildings that served the machinery of the day. The scale of the era was ambitious at the time but has now been vastly overtaken. Old meets new at the Foundation, where construction continues in some areas. This project shows how this period’s architecture can be incorporated, with spaces and places that link the past and the future. This past is for Italy – with its Millennia of history – a more recent past, but an important one that has all too often been left to decay or been brushed aside. Italy has traditionally been a maker culture. I happened on the site in the Galleria where Campari was first made and I find myself wondering what was distilled in this factory. Prada at its core makes Italian Products for the global market. It seems so appropriate that they have chosen this venue for their Foundation. Bar Luce at the Prada Foundation. Wes Anderson designed Bar Luce in the complex. Anderson created a short film (below) for Prada that is at once a sentimental and wonderful take on Italian and Italian American culture. There is no ideal angle for this space. It is for real life . . . I tried to make a bar I would want to spend my own non-fictional afternoons in. The space draws on aspects of Italian popular culture and aesthetics rooted in the 50s and 60s, but like much that is great in Italy it is part of a continuum. There are many interesting and beautiful details at the Foundation, and several shows that are currently being presented. At the center of the complex, an old five-story structure called the Haunted House is covered in gold leaf. It becomes the pivot point for the entire composition. L to R: The gold leaf exterior of the Haunted House; “Untitled” and “Corner Door and Doorframe,” by Robert Gober. Works by Robert Gober inhabit much of the spaces and are in dialogue with two works by Louise Bourgeois. Seriality, replication, imitation, and appropriation were at least as important throughout the Classical period as invention and originality. The creation of a collective, serial, repeatable language of gestures, typologies, and values made Greek art what it remains today: “classical.” By exploring the ambivalent relationship between originality and imitation, the exhibition bridges antique and contemporary concepts of replication, imitation, and creative appropriation. The sculptures are profoundly beautiful and dramatically installed by OMA which has created different topography within their own building through the use of additional travertine floor slabs. In the South and North buildings are selections from the permanent collection. In the basement of the Cinema building is a show that explores Thomas Demand’s grotto photograph process. The Cinema itself was closed so I was unable to see the show “My Inspirations” on the work and influence on Roman Polanski. Several works are exhibited in the old Cistern building, including the eerie “Lost Love” by Damien Hirst.